Weekend Breakfast: Warm Bittersweet Chocolate Chip Scones With Butter (makes 9 to 10) | Crappy Kitchen - Good Dinners! I am writing this while eating this gorgeous breakfast treat fresh from the oven 3 minutes ago! 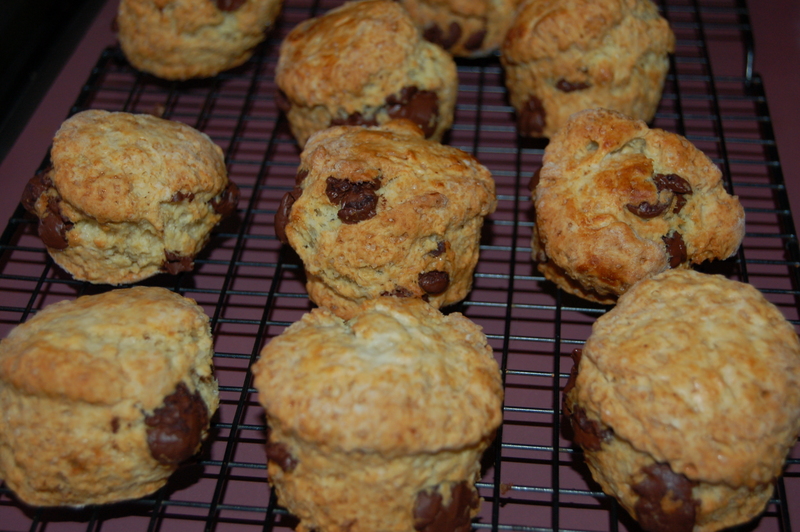 There is nothing quite like a freshly baked scone and coffee to start off my Saturday. If you want to have the same glorious morning as I, I suggest you run into the kitchen this minute and whip these up. They take about 5 minutes to put together and they are so worth it. These are especially good if you have a few people staying for the weekend. It is an easy way to give everyone breakfast without making a total mess in the kitchen (like when you decide to make omelets or fry bacon and eggs etc!) and your guests will think you are amazing forever! 1 – Put flour, baking soda, sugar and salt into a large mixing bowl and mix together with a manual whisk to incorporate the ingredients fully. 2 – Slice the butter into the flour and work into the flour using fingertips until you have a fine rubble. 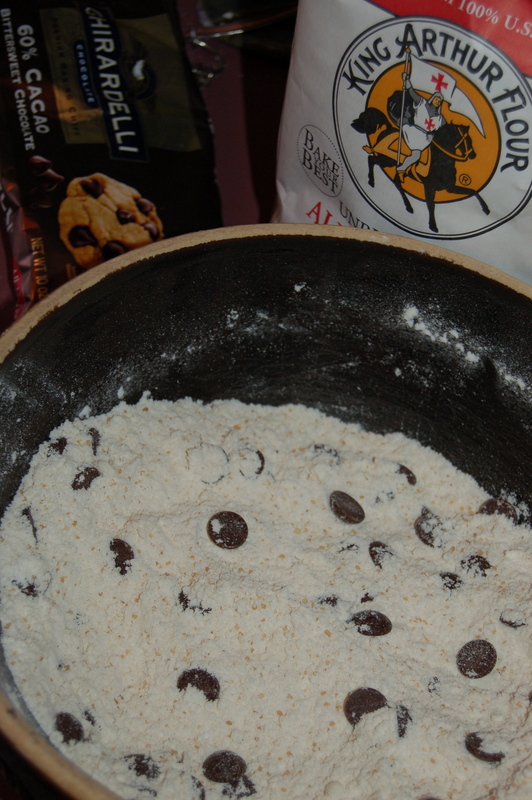 Add the chocolate chips and mix with your hands. 3 – Make a well in the center and add the buttermilk and mix with a wooden spoon until you have one dough ball. 4 – Turn the dough onto a floured surface and knead a few times before making a thick disk (about 1″ inch or slightly thicker). 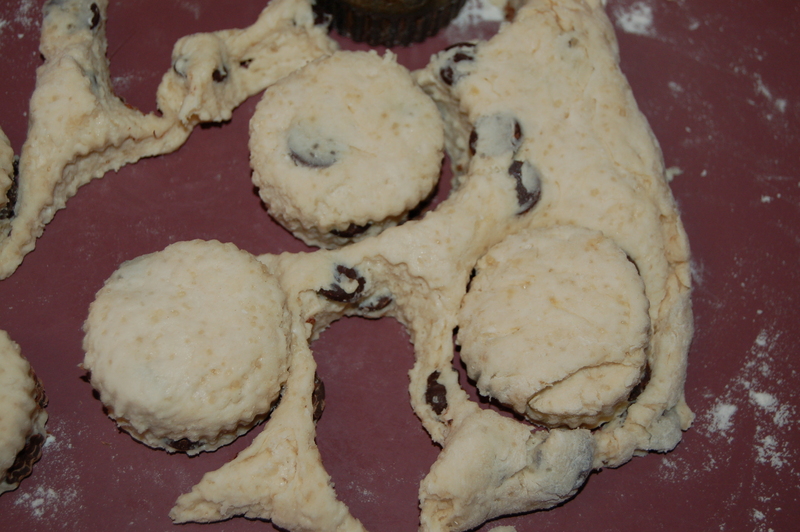 Use a cookie or biscuit cutter 2″ in diameter, cut out 9 to 10 scones. You should get about 6 to 7 in the first round, then pat the dough out to finish. 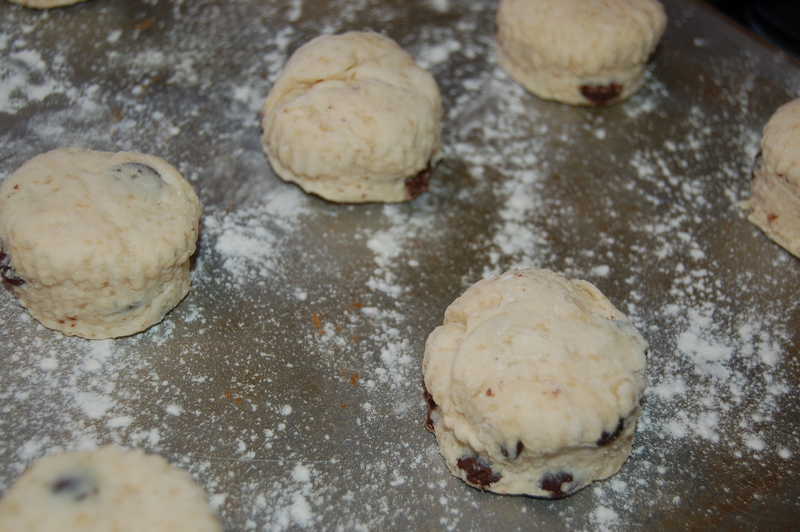 5 – Place on lightly floured cookie or baking sheet and brush a little buttermilk on top of each scone before placing in oven for between 17 to 20 minutes. Check after the first time and remove when golden brown. Serve right from the oven, split with butter or butter and jam. 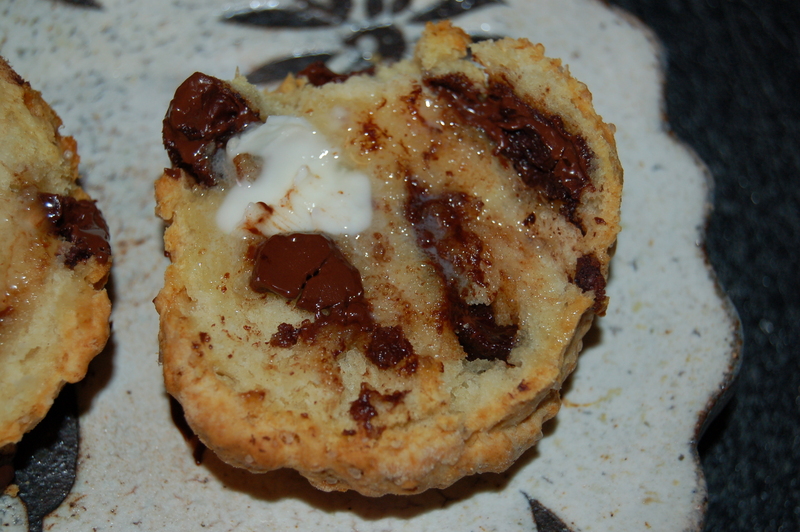 This entry was posted in dinners and tagged bakery treat, bitter sweet chocolate, bittersweet scones, breakfast, breakfast food, chocolate chip scones, chocolate chips, scone and coffee, scones. Bookmark the permalink. 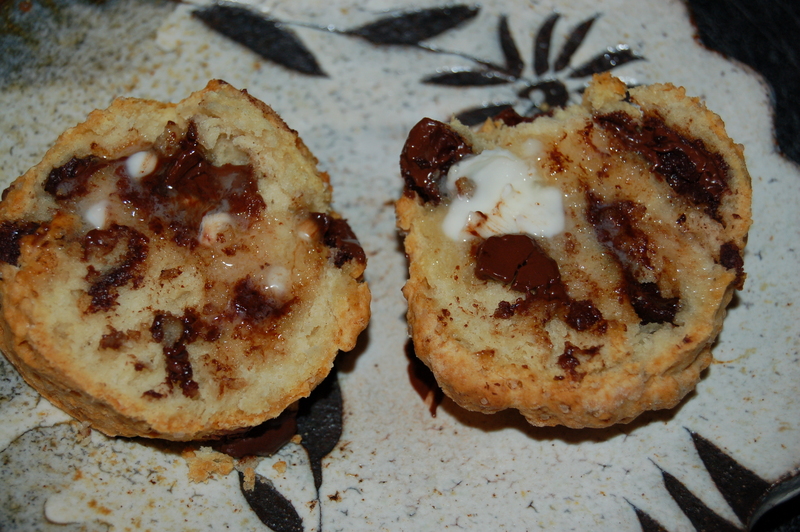 Pingback: Warm Chocolate Muffins On A Lazy Saturday Morning (makes 12) | Crappy Kitchen - Good Dinners!